Zuckerman will join leading American exporters at the 31st Annual National Small Business Exporter Summit. His presentation will focus on “exporting is easier than you think," including where to start looking for information, how to build relationships, and how to get the product into customer’s hands cost-effectively and safely. 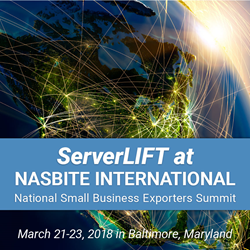 Ray Zuckerman, the CEO of ServerLIFT Corporation, will speak about exportation on March 21, 2018 at the National Small Business Exporter Summit in Baltimore, Maryland. Experienced with manufacturing company growth and foreign market penetration, Zuckerman will join leading American small and medium-sized exporters in celebration of the National Association of Small Business International Trade Educators' (NASBITE) 31st Annual Conference & National Small Business Exporter Summit. Summit participants will share best practices and lessons based upon their own export success. According to NASBITE, educators, exporters, specialists, and students from all across North America participate in the event’s forum, which focuses on export growth. The conference provides participants with opportunities to network and attend educational conference sessions, exhibits, and student competitions. Zuckerman’s presentation will leverage his experience with exporting from the United States and corporate growth to focus on demonstrating the basics of exporting. His discussion will cover the basics, including where to start looking for information, how to build relationships, and how to get the product into customer’s hands cost-effectively and safely. ServerLIFT manufactures the only data center server lifts capable of safely and efficiently assisting IT staff to transport, position, and install or remove servers from server cabinets and racks. The lift effectively navigates the data center environment and positions and supports servers precisely for safe, easy installation. The company has set a new standard for data center server handling safety and efficiency.